INDIANAPOLIS — Football stadiums are rarely library-like atmospheres, but that’s the vibe at the NFL combine. Mid-morning last Saturday, the loudest noise on the Lucas Oil Stadium turf was the sound of a battery-powered massager being used by the second group of quarterbacks and wide receivers to keep their leg muscles loose. On the first NFL stage of these players’ football careers, the silence can be deafening. Between the flexibility measurements and the vertical jump, one of the quarterbacks in the second group turned toward Mark Brunell. “Did you run at the combine, too?” he asked. The moral of the story: even if you whiff on these combine drills, you can still go on to have a 19-year NFL career. Not a bad way to cut the tension. Here, the next class of NFL players is being watched by every talent evaluator in the league. They are all armed with binoculars, a stopwatch and a very critical eye. On the turf field, the prospects were led through a gauntlet of skills and fitness tests by a group of scouts and coaches that included Cleveland’s David Lee and Chicago’s Dave Ragone, quarterbacks coaches whose clubs may look to address a critical need with one of these players. Plus, a robust NFL Network crew was on the field to broadcast and dissect the players’ every move. But there’s also a port in the storm—a group of retired players who work as part of the NFL’s Legends Community, which was created in 2013 to connect the past generation of players with current and future ones. They embed for four days at the combine with the prospects at the position they once played, accompanying them to places where their agents and trainers can’t go. They were all in this spot once, and from there, their careers took very different paths: Brunell, a fifth-round pick by Green Bay, started for Jacksonville and Washington; Chad Pennington, who played 11 seasons after being drafted 18th overall by the Jets in 2000; and Ryan Leaf, whose career infamously flamed out just four years after being the second pick in 1998, one spot behind Peyton Manning. 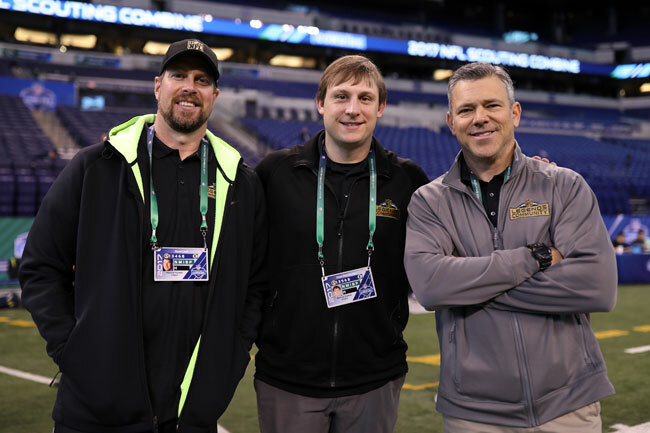 The MMQB watched the combine from their view, at field level and a few yards away, as the next generation of QBs auditioned for the NFL. From l. to r., Ryan Leaf, Chad Pennington and Mark Brunnell. There’s no subtlety at the combine. The NFL-issued uniforms this year, navy blue shirts and shorts, had a message printed on the back of the neck: Make History. Another slogan—The Future Starts Here—was printed on the wraparound banners around the field. It’s not like a pro day, where players are in a familiar environment, with their teammates, on their own schedule. Adding to the pressure is the fact that players compete one at a time in each drill, so they watch in real time how they measure up against each other. By the time they return to the bench to change shoes between jumping and running and throwing, they can pull up a full analysis of how they’ve performed on their phones. Starting in 2015, the NFL began pairing retired players with the prospects at the combine and having them act as guides to help the next generation of players through the pre-draft process and into the NFL. They meet at orientation on their first night in Indy, and over the next few days, the questions flow: How honest should we be in team interviews? What will our schedule be like in the NFL? How did you study film? Pennington’s favorite piece of advice is that your notebook is your best friend. In other words, the only way to catch up to the veterans is to take a bunch of notes. Leaf was sharing his story at Super Bowl 50 in San Francisco last year when he ran into Pennington, who welcomed him into the community of retired players. Leaf hadn’t been back to the combine since 1998, nor had he watched it on TV. At his combine, he showed up about 20 pounds overweight and famously missed a meeting with the Colts, who were deciding between Leaf and Manning for the first overall pick. He was anxious about returning, and there were a few awkward moments—for example, running into the salary cap guru for the Chargers, whom he once battled to keep his full signing bonus after Leaf had been suspended by the team and fined for insubordination. But as he shadowed Pennington, he saw the chance to put his experiences to use, rather than be embarrassed by them. As the quarterbacks stepped up for the vertical jump, Leaf cheered them on. “Explode!” he called out. He even pulled out his phone to take video. When Texas Tech’s Patrick Mahomes, who is represented by Leaf’s former agent, Leigh Steinberg, hit 30 inches, Leaf nodded approvingly. “He’s hitting those little invisible lines scouts are looking for,” he said. One of the quarterbacks asked him how high his vertical jump was, and Leaf told him 36 inches—but, he added, that was the only combine event in which he competed. To anyone who asked, Leaf said his career didn’t pan out how he wanted it to because he wasn’t capable of working hard. He was offered mentors, as Steinberg gave Leaf phone numbers for fellow clients Steve Young, Troy Aikman and Drew Bledsoe, but when Leaf’s career began to veer off course, he felt like he couldn’t call them anymore. 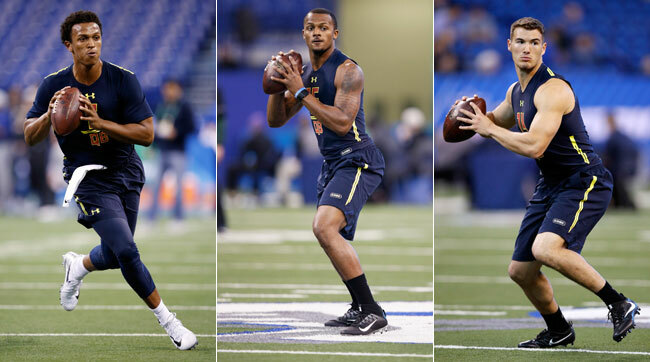 There are two groups of quarterbacks and receivers at the combine, ordered alphabetically. The first group—Iowa’s C.J. Beathard through Minnesota’s Mitch Leidner, ran their 40-yard dashes at 9 a.m. and began the passing drills a little before 11. The second group, Colorado’s Sefo Liufau through Cal’s Davis Webb, watched from the sideline. The throwing session takes about an hour. There are pocket movement drills, in which the quarterbacks move in different directions on command with the ball in their hands, and then fire a throw. There’s the famous gauntlet drill, mainly for the receivers, who run across the field while alternately catching balls from opposite sides. What matters most is when the quarterbacks take three-step, five-step and seven-step drops as they go through the route tree, throwing slants, outs, ins, corner routes and the go, to the left and right sides. Pennington watched from the sideline, standing shoulder to shoulder with Baylor’s Seth Russell. “I don’t want to mess you up,” Pennington told Russell, but as the first group moved through the route tree, he called out when certain throws should be released. Efficient footwork, he reminded him, allows your throws to be on time and accurate. “Yes, sir,” Russell said, nodding at each thing Pennington said. Later, Pennington suggested to Pitt’s Nathan Peterman a footwork adjustment that could help him generate more power and velocity on his throws. Every top quarterback threw at the combine this year, perhaps because there’s no consensus No. 1, and many still have questions to answer among NFL evaluators. There’s a big group in the first-round conversation—North Carolina’s Mitchell Trubisky, Clemson’s Deshaun Watson, Notre Dame’s DeShone Kizer and Mahomes—but teams aren’t sure any of them can be a Week 1 starter. From l. to r., Notre Dame’s DeShone Kizer, Clemson’s Deshaun Watson, and North Carolina’s Mitchell Trubisky. Kizer threw with the first group and then came up to talk with Pennington afterward, walking through his footwork as they spoke. All week, Kizer had impressed teams by the way he handled himself in formal interviews, but he was a little inconsistent in his workout. Afterward, he described himself as being “drastic” on some throws to the left. Pennington reminded Kizer to be a passer rather than a thrower, a mindset he plans to take into the Notre Dame pro day later this month. They spoke, for a few more minutes, about Watson’s transition to the NFL. Stay in the pocket as long as you can, Pennington told him, and remain a passer as long as you can. That will create longevity in this league. And, remember to use your notebook. Watson thanked Pennington for the encouragement. He shook his hand. “Can I be in touch?” he asked.